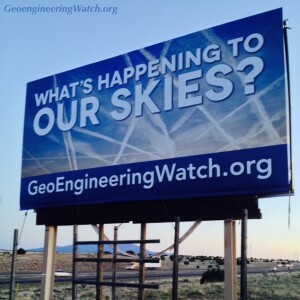 With the continuing help of friends and allies in the battle to expose and stop climate engineering, another geoengineeringwatch.org billboard has been put up on a major US highway. This latest billboard is in New Mexico, on I-25 between Santa Fe and Albuquerque. Billboards have a visual impact that helps to breakdown the well programmed denial of our society. The “normalcy bias” of our population is so profound that most have no idea what is going on in the skies above their heads day after day, already for decades. When the subject of climate engineering is brought up to the uninformed, the “conspiracy theorist” term is often the conditioned response without any conscious thought or consideration. Psychological studies prove that those who question are sane, those who blindly accept whatever they are told by “official” sources have psychological deficiencies. The more a particular threat is pointed out or “advertised”, the more possibility there is of breaking down the denial. Thus, the anti-geoengineering billboard campaign continues.